Both definitions share a very organizational, a very corporate orientation. 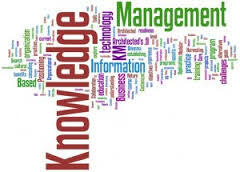 Knowledge management historically at least, is primarily about managing the knowledge of and in organizations. Knowledge is most commonly categorized as either explicit or tacit (that which is in people’s heads). This characterization is however rather too simple, but a more important point, and a criticism, is that it is misleading. A much more nuanced and useful characterization is to describe knowledge as explicit, implicit, and tacit. Explicit: information or knowledge that is set out in tangible form. Implicit: information or knowledge that is not set out in tangible form but could be made explicit. Tacit: information or knowledge that one would have extreme difficulty operationally setting out in tangible form. The classic example in the Knowledge management literature of true “tacit” knowledge is Nonaka and Takeuchi’s example of the kinesthetic knowledge that was necessary to design and engineer a home bread maker, knowledge that could only be gained or transferred by having engineers work alongside bread makers and learn the motions and the “feel” necessary to knead bread dough . The danger of the explicit-tacit dichotomy is that by describing knowledge with only two categories, i.e., explicit, that which is set out in tangible form, and tacit, that which is within people, is that it then becomes easy to think overly simplistically in terms of explicit knowledge, which calls for “collecting” KM methodologies, and tacit knowledge, which calls for “connecting” KM methodologies, and to overlook the fact that, in many cases, what may be needed is to convert implicit tacit knowledge to explicit knowledge.